This weeks review is a cigar I have been dying to try, and lucky enough not to have to wait ages to get my hands on. Tatuaje’s new blend of the Tabacos El Triunfador. This cigar just recently started hitting the market, and are quickly flying off cigar retailers shelves nationwide. These sticks came direct from the wonderful people at Bonita Smoke Shop, who are currently stocking the Triunfador as well as many other Tatuaje blends. 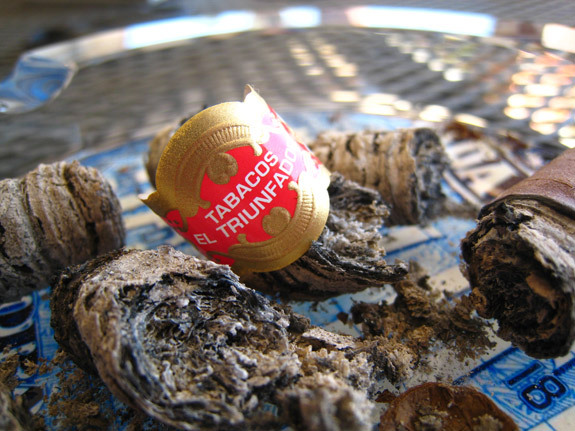 The Good Stuff: This is a re-release of Tatuaje’s old blend of El Triunfador. The only main differences are the new blend is released in 6 different sizes: The #1 which is a 6.5 x 42, the #2 which is a 5.5 x 52, the #3 which is a 5.62 x 46, the #4 which is a 4 x 48, the #5 which is a 4.4 x 42, and the #6which is a 7.5 x 38 vs the old blend (which will still be in production) only came in lancero form. And the wrapper, the old Triunfado blend was wrapped in broadleaf, where as in the new Triunfador blend, the cigar is wrapped in Habano. Prelight: Pete Johnson and Don Pepin are no strangers when it comes to excellect craftmanship in thier products, and The Triunfador is a great case study for that. The wrapper is extremly oily, silky smooth, and a very consistent rich brown topped off with the famous, rounded tripple cap. The #1 is a box-pressed cigar, but much like the La Riqueza the edges have quite a bit of roundess to them. Although this vitola is very thin, the cigar is still very firm with little give when squeezed, not to mention I could find no soft spots what so ever on this stick. The band on the new El Truinfador is a simple, yet elegant red/white/and gold design, again resembling a scaled down version of Pete’s La Riqueza’s Band. The Triunfador gives off quite a bit of aroma, ranging from very sweet tobacco to an almost nutmeg that I can only hope carries through in the actual taste of the cigar. 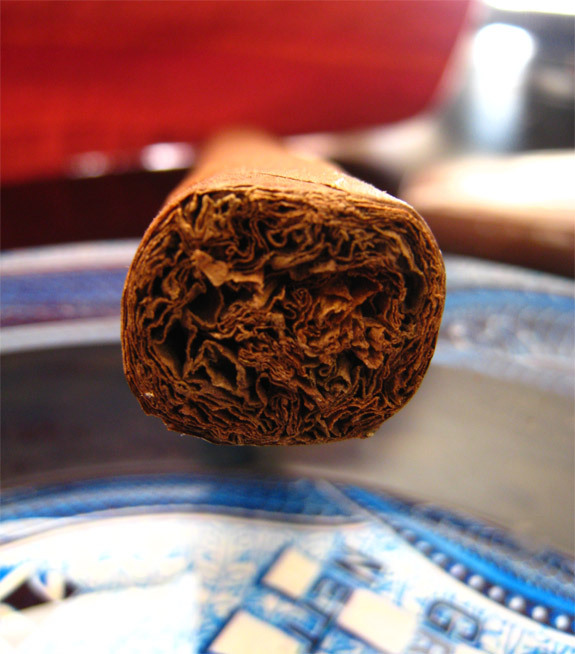 The cold draw produces a very similar taste to the aroma, sweetness, tobacco, and a hint of spice. I had no problems clipping this cigar using my Palio double bladed cutter. First Smoke:Tatuaje’s Tabacos El Triunfador lit up instaneously under my triple flame butane torch. I was expecting to be hit with the burst of pepper that most Tatuaje cigars start out with, but instead I was greeted with an extreme sweetness. The main tastes overall where a mixutre of very sweet tobacco (gotta love that), nutmeg, and a nutty after taste. The Triunfador starts off very smooth, and you can almost tell right of the bat that this is going to be a very mild cigar. I actually smoked this one for the review first thing in the morning. I am not a morning smoker at all, which shows just how mild this cigar really is. The draw was effortless and plentyful, producing a thick, lingering cloud of dark-grey almost brown smoke. The Triunfador doesn’t give off very much stationary smoke at all, but what little smoke that resides is very light scented with sweet tobacco, bits of cocoa, and cedar. The burn line was razor thin, and dead even leaving behind a thick, solid, light grey/white ash. 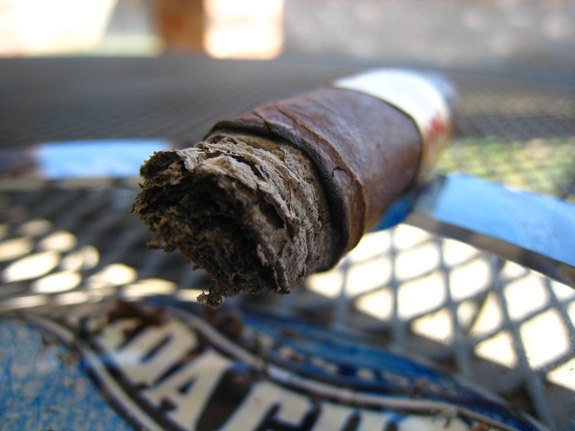 The ash held on for about an inch before tumbling into my ashtray. Halfway There: I’m halfway into this Triunfador, and I am extremly impressed with how sweet, and smooth this cigar is. The sweetness is still present in full force, where as there has been off and on hints of pepper, mixed with lots of nutty aftertastes. There is also quite a bit of woodsy/cedar tastes making face in these complex mashup. 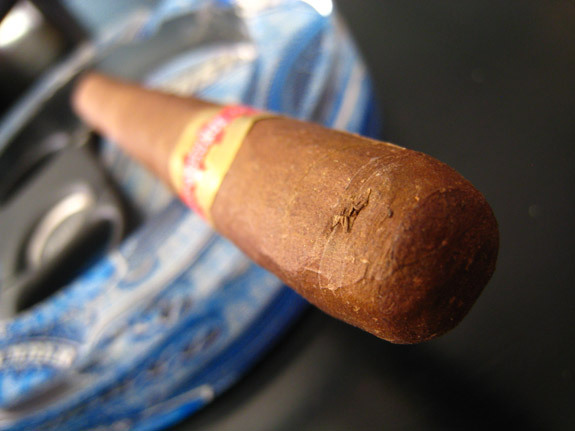 The nutty after taste seems to be very prominent once I take a few sips of the water that I paired this cigar with. 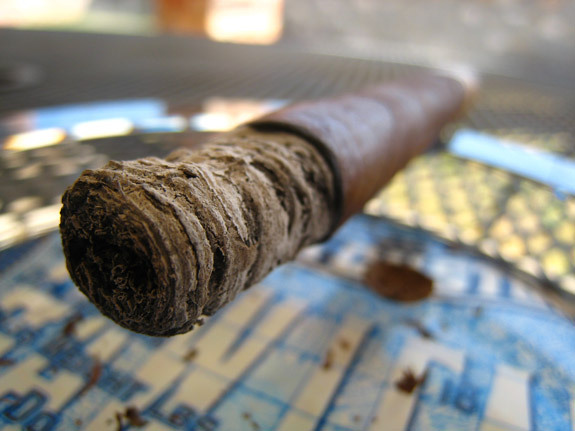 The burnline is still dead even, and I haven’t needed to touch this cigar up at all. One side note is the speed in which this cigar burns. This was a longer vitola, and it only took me about 25 minutes to get halfway through it. I am not the fastest smoker, but I am far from a slow one so just be prepared, this won’t be an all nighter. Finish: As if the Triunfador didn’t already shine in the first 2 thirds, the last third put it over the top. The sweetness stayed strong from start to finish, the pepper taste had completely vanished after the second third only to be replaced with cedar and nut. The last third really layed down the cedar flavor matching it up with the sweet, sweet tobacco for a perfect pairing. I had absolutely no problems with draw or burn. 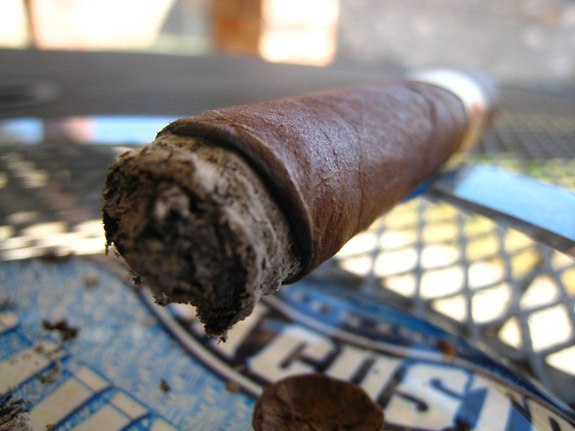 There was no harshness, and I was honestly very surprised that the cigar did not burn very hot at all towards the nub. I was able to take this one down as far as I could hold it without burning my fingers. Smooth smoke from start to finish with no signs, at all, of any nicotine. All in all this cigar took about an hour to smoke. Overview: Needless to say, I am all about this cigar right now. AWESOME flavor profile, just enough changeup to keep my attention, smooth from start to finish. The El Triunfador is a winner in my book. Pretty much my only gripe about this stick is the fact that it smoke so fast. If it would burn any slower though, I am sure there would be a bit of harshness built up so I am willing to give it a free pass on that one. I honestly think this cigar would appeal to anyone who enjoys smoking. Don’t pass this one up! Price point is about $7 – $9 a stick, and although you’ll tear through them quickly, I think its a great price for the product. 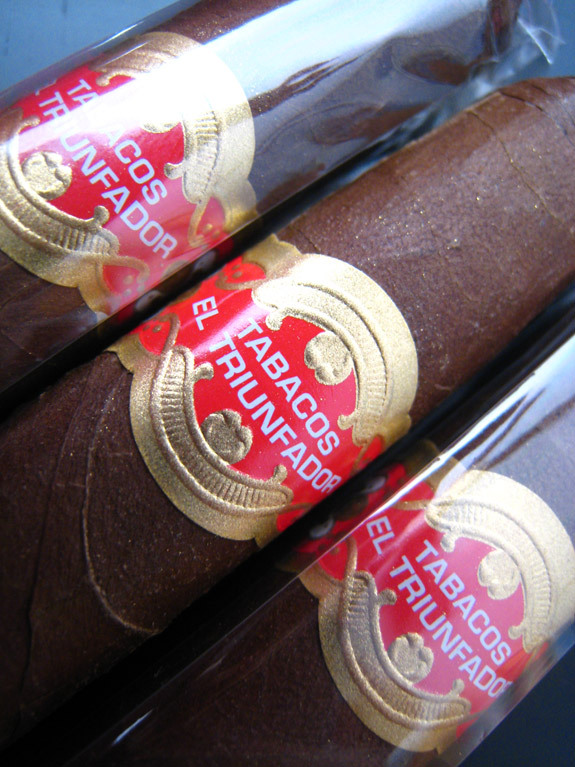 On a side note:If you are interested in the Triunfador, a good friend of ours Dan Reeve is actually on an adventure to smoke, and review each vitola in the new line. Head on over to his site ( http://crookedburn.blogspot.com/ ) for full coverage! I have only had the pleasure of trying the #3 and I loved it! Looking forward to trying the #6 since the original release El Triunfador sits as my current favorite lancero. Thanks for the read man, you’re quick! I just barely posted this guy! I had the first taste of the OR El Triunfador at a herf and then went online and bought the last 2 boxes of the original 2008 release sticks I could find. They were a bit more as far as price but they were aged to perfection! Same blend as the Cabaiguan Maduro without the ligero so they are smooth and delicious. There is still a little spice kick coming from the broadleaf wrapper but it only helps to compliment the flavors. I would recommend pulling out one of those sticks and giving it a shot. Sounds like something I’d love. I loved the Cabaiguan Maduro. WAY the heck up there on my list. I have family coming over today, perfect time to pull one of the bad boys out. If it happens, I’ll let ya know what I think! great review, and thanks for the plug man. I too love these cigars. I haven’t had the chance to try the old or new blends but they are definitely on my list of purchases next time I get a chance. Especially after reading this review! Damn you Tony! Stop making me want to buy cigars I don’t really need! This stogie sounds amazing. Exactly the flavor profile I search for. My wife dislikes you very much my man. Dan – Thanks and no problem man! Daniel – Totally worth it. Very relaxing, enjoyable cigar. I’ve smoked through quite a few just this weekend alone. Jared – HAHA! Sorry man. Sadly thats part of having a passion for cigars and I have learned that real quick. No matter how many you have, you always want more. 🙂 Cheers! I want to snag a sampler of all the sizes one of these days to find out which I would prefer. Yeah I’m interested in that too. I’m usually a fan of larger ring gauges but I’m not sure that would be my choice in this particular blend. I bet the lancero rocks.